Hi guys, it’s Aki, the member of Sternbild who has Morita’s fanboyishness a new interview for you today! 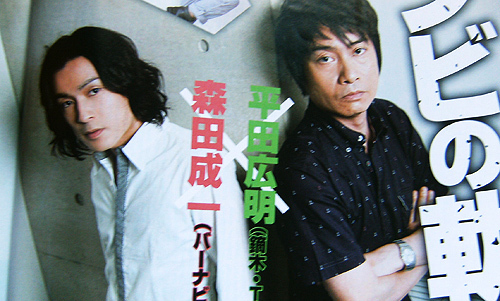 It was published in the September issue of Animage and features Tiger and Barnaby’s seiyuu, Hirata Hiroaki and Morita Masakazu. You can read the previous translated interview with these two here. Note: This interview was printed out in full in Roman Album from Tokuma Shoten. This is an abridged version. Disclaimer: not a professional translator, doing this for fun, etc. Standard fantranslation rules apply. Q: Is acting in an original series like T&B hard? After all, you can’t read ahead and you don’t know what will happen next. Hirata: In an original series you have to create the whole world from the start, but in this case the worst were the two first episodes. After that, I was just looking forward to opening the scenario every week. Morita: The show is really exciting, so I look forward to the recordings, too. It’s hard to play Barnaby because his actions and emotions show in his voice, but because it’s a first time for me to play a character like that, I treat it as a challenge. It really makes me happy. Q: Barnaby doesn’t really show it, but he’s a character overflowing with emotions, isn’t he? Morita: Yeah. He’s a character of many faces that change continously – he can be gloomy, and he can be passionate. Sometimes it’s really hard to decipher whether he wants to keep it cool or shows a bit of his passionate side when he speaks, so the role requires a lot of subtle changes in acting. Sometimes, playing him makes me a bit nervous. Q: Compared to Barnaby, Kotetsu’s behavior isn’t that hard to understand, is it? Hirata: Well, to be honest there are times when I seriously wonder if the old man really understands Barnaby’s emotions (laughs). Morita-kun said that Kotetsu is the adult here, but I don’t think it’s that simple. I mean, he’s an idiot (laughs). It’s hard to believe he really got married and even has a daughter when you look at how oblivious he is when it comes to Blue Rose. Q: In the new OP, Kotetsu’s wife appears. Isn’t she pretty! Hirata: Yes, yes. A person of high caliber, I’d say. Hirata: But really, I think that Kotetsu with his strong beliefs and faith that he’ll always somehow fight his way out of the problems really is something, too. Q: At first, it didn’t seem like Kotetsu and Barnaby’s team would work, but from the second cour, it seems they finally got closer. Morita: From the beginning Barnaby was jumping into action here and there so it was difficult to show it through my voice, but if you look at their relationship, I think they were slowly getting there all the time. They had a small break-up before the fight with Jake, but in episode 13 we finally got to hear Barnaby say “Kotetsu-san”. Then, after the 10 month time gap and from the beginning of the second cour, Barnaby was already clinging to Kotetsu (laughs). Q: He really mellowed out, didn’t he? (laughs) By the way, in episode 19, another crisis in their relationship begins. Morita: Yeah. When I was surfing the net, I saw a lot of comments from the fans. “His tsundere side was much better” and the like. I felt so wounded! (laughs) So when episode 19 happened, I just wanted to tell them in loud voice “Well, how about this. You got your tsundere back!” (laughs) But I think his tsundere side now is a bit different, so please, pay attention to the way he acts! Q: On the other hand, we have Kotetsu and his big problem with his powers slowly disappearing. Hirata: I really wonder what will happen to him. I think that for his daughter’s sake, he has gracefully accepted whatever is happening to his powers. And then we have this misunderstanding between him and Barnaby – and really, I think it was bound to happen sooner or later. But to be honest, I still don’t grasp everything that is happening. Q: From this point on, what will happen in the story regarding Kotetsu and Barnaby? Hirata: Well, truth to be told, Sky High’s VA, Inoue-kun, learned from one of the staff members what will happen in the show until the very last episode. Morita: Uhuh. He tried to tell us, but everyone told him to shut up (laughs). Hirata: I only know what will happen in the next few episodes, nothing more than that. Morita: The staff members only tell some hints regarding the next few eps to the cast members that require this knowledge to play their characters right, but it only happens when it’s absolutely necessary. That’s why the cast members actually discuss what might happen next in their free time. But to be honest, so far our predictions have been wrong every single time. We really look forward to the climax of this show together while speculating. 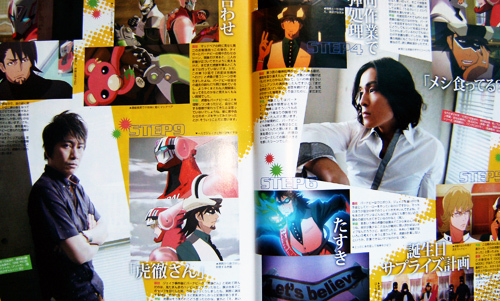 Morita: Both Kotetsu and Barnaby were in their old suits. Morita: I really like bikes, so I was like “oh yeah!” when they got paired together, received a bike, and Barnaby turned out to be the one to actually drive it. You know, I feel nostalgic when I look at sidecars. They are really difficult to drive. I think it suits them well, but I thought my senpai would be the one to drive it (laughs). Morita: The first half of the series was full of Kotetsu meddling, like him asking Barnaby if he’s eating properly. The director told me to keep turning him down for now. After I was done with saying my lines, I was out of breath, always cutting the conversation. When talking with Kotetsu, you could almost taste the “shut up” atmosphere. Hirata: I guess it’s just Kotetsu’s thing to go on talking even when he’s been turned down. In this scene it neither seemed like he’s trying to reject Barnaby, nor did his very best to make their partnership work. I don’t see many people like that around me, so I find him fascinating. Morita: Episode 3, when they deal with the bomb. At first, I kind of misunderstood this scene – I was sure that Kotetsu and Barnaby got a bit closer here, so I wanted to show that nuance during the rehearsal. However, the director told me they still didn’t get close at all here, that I should keep turning him down. I guess even barely escaping death didn’t help them much. Hirata: Putting Barnaby’s attitude and personality aside, I guess Kotetsu kind of wanted to show Barnaby how to be a good partner here. I think that the whole incident really showed that Kotetsu is a hero of a high caliber. Morita: Barnaby was acting as if he had nothing to do with the whole thing. It’s the episode when the GOOD LUCK MODE happens for the first time – it left a giant impression on me. I laughed a lot at Saito-san’s idea – some parts of their suits get bigger, but their power is still the same, seems like a giant waste of budget to me. And Barnaby was so cute when he was going back with that giant leg. Oh, and the shape of his present. There were fans who sent me pictures of their bunny plushies using their Twitter accounts, I was so happy! Morita: Because Barnaby became a hero to catch Jake and Ouroboros, I was really waiting for their appearance. But in the meantime, the old man kept getting rejected, and never learned his lesson, I was wondering if I’d ever see him give up (laughs). Hirata: Seriously, sometimes I wonder where Kotetsu gets this faith in himself from. I think it’s just that he’s the type that never even thinks about losing. Personally, I’d think about many things while facing his problems. I don’t think it’s just that Kotetsu doesn’t plan his actions, he just… isn’t capable of planning them (laughs). Morita: During the Mad Bear incident, and after the second bridal-style hold, we have this scene with Kotetsu and Barnaby standing back-to-back. If we look at them from today’s perspective, you can see they got closer, but Barnaby still wasn’t depending fully on Kotetsu. In this episode we also had this scene with Kotetsu telling Barnaby to go to the prison. Barnaby slowly starts revealing his past, finally engages in a proper relationship with another human being, finally makes progress. Hirata: Kotetsu starts understanding Barnaby better, but I don’t think his own attitude changed much here. For me, it felt as if he just wanted to make this cool back-to-back pose thing more than anything else. Why won’t you believe in me? Hirata: I think this episode felt so real. Kotetsu didn’t really want to show he doesn’t trust Barnaby, so when his partner pointed it out he was really depressed. I think this is where Kotetsu’s human side shows really well. Morita: At the end of Jake’s incident, Barnaby says “Kotetsu-san” for the first time. Isn’t it just a real happy ending? When I saw this line in the scenario, I was quite shocked. During the recording, I remember being a bit embarrassed while saying it. Hirata: I wonder what Kotetsu thought when Barnaby said that. Maybe he was so shocked, he just went “E-Eh, what’s wrong with him?” in his head? (laughs) I mean, it’s not like he wasn’t happy about it – it’s just that their relationship didn’t change rapidly the moment he got called Kotetsu-san. I think it took Kotetsu some time before the full meaning of Barnaby’s words dawned on him. Thank you very much for this. It’s both interesting and satisfying to see the VA’s view on their characters… especially when their insight and yours are the same XD. You’re welcome! Exactly the reason why I translate the interviews in the first place, Taibani’s seiyuu make some really great points in their interviews. And are just plain dorky while at it, so it’s a nice bonus! Thank you very much for the awesome translation! I love how Barnaby’s seiyuu himself says that his character is tsundere! XD It was very fun to read, thanks! … Kotetsu’s seiyuu looks like a real life Muramasa. DO WANT!! !